Update: On Thursday a jury of 12 people, plus four alternates, was seated. Opening statements are expected to begin on Tuesday, Nov. 7. Thursday marks the fourth day of jury selection for the trial of Nevada rancher and melon farmer Cliven Bundy, who is being prosecuted in federal court along with two sons, Ammon and Ryan, and Ryan Payne of Montana. The men face a raft of charges including conspiracy to impede or injure federal officers, and obstruction of justice, as part of an armed confrontation outside Bunkerville, Nevada, in 2014. Attorneys have been questioning prospective jurors this week in U.S. District Court, in Las Vegas, following up on multiple written questionnaires. In the past several days, attorneys grilled prospective jurors on their thoughts about the right to protest, attitudes toward government — FBI, Bureau of Land Management and Department of Justice in particular — and how the Oct. 1 mass shooting may have affected their attitudes toward guns. 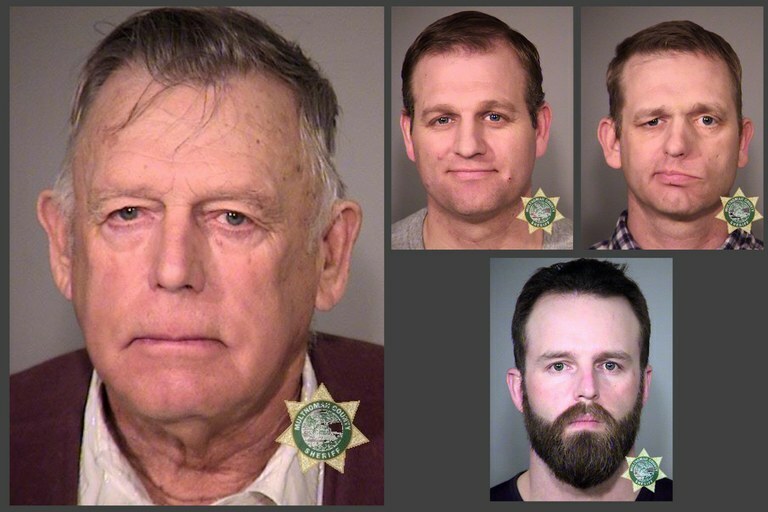 Cliven Bundy, Ammon Bundy, Ryan Bundy and Ryan Payne. Several prospective jurors were excused this week because they expressed lasting psychological effects of the shooting, which left 59 people dead, including the shooter, and 500 injured. Cliven Bundy’s attorney, Bret Whipple, asked one woman: “If you were sitting where my client is, would you want someone like you (on the jury)?” “No,” she responded. “I would want someone emotionally stable.” Another woman who was nearby the shooting said hearing the first juror speak about the events made her “teary-eyed.” Both were dismissed. Schiess also asked questions to gauge jurors’ potential empathy for law enforcement officers facing armed confrontation. In trials earlier this year, the government had law enforcement officers testify to feeling afraid for their lives during the 2014 standoff. “The jurors didn’t believe any of that,” Chris Rasmussen, defense attorney for Pete Santilli, said in an interview last month. Taken together, the opening days of jury selection point to a trial that will put many questions to the test: guns, violence, the First and Second amendments, the media and federal authority. All of these issues came to the fore in the 2014 standoff, in which the BLM and National Park Service were prevented from rounding up Bundy cattle that had been illegally grazing public lands for decades. But they have also dominated national news in recent months, as armed groups take part in protests that have often turned violent across the country. This trial, which could last four months, includes Cliven Bundy in addition to the Malheur occupation leader, Ammon Bundy, so it will have the highest profile yet of a series of trials related to both the 2014 Nevada and 2016 Oregon events. Prosecutors have so far failed to achieve significant convictions in either incident, a sign that some experts warn could embolden extremist groups like some of those that came to the Bundys’ aid. Prosecutors have retained a private jury consultant, Laura Dominic, whom the U.S. Attorney’s Office in Oregon hired last year for the Malheur trial. The defense team in the Nevada trial has multiple consultants. It can be hard to predict what factors will influence a jury. In the Bundy case for instance, one issue that looms large for southern Nevadans that could shape attitudes toward federal land management, is the controversial proposal for Yucca Mountain waste facility 100 miles northwest of Las Vegas. The project is on hold at the moment, though a bill to restart the process is currently making its way through Congress. The proposal continues to be a source of tension for many Nevadans who don’t want the federal government dumping waste in their state. Yucca appeared to influence at least one juror’s attitudes toward federal land management in a Bundy standoff trial earlier this year, since they brought it up during a debrief session after trial, Rasmussen said. The conundrum of wild-horse overpopulation — a major issue in this state — also contributes to many Nevadans’ view of the federal government. One prospective juror said this week she was concerned about the BLM’s treatment of wild horses taken off public lands. “I think it’s cruelty to animals when they round them up with helicopters and you see the terror in their eyes,” she told the court on Tuesday. Attorneys have been working toward favorable jury selection since last year. In October 2016 defense lawyers Brenda Weksler and Ryan Norwood, motioned to move the trial to Reno, because they said the Las Vegas jury pool may have been tainted by media coverage. In January of this year, they pushed to expand the jury pool to include the entirety of Nevada, in the hopes of avoiding drawing too many urban Democrats for the jury. “A jury pool from the Las Vegas division will include more jurors registered to a more ‘liberal’ political party than the other two divisions,” the attorneys wrote. U.S. District Court Judge Gloria Navarro and Magistrate Judge Peggy A. Leen denied the motions. Meanwhile, themes of mistrust of the federal justice system, which became a central characteristic of trials earlier this year, are already beginning to show in court. On Wednesday, prosecutor Assistant U.S. Attorney Daniel Schiess made a comment about how there needed to be an even playing field when it comes to selecting jurors favorable to each side of the case. “I object to the way he characterizes the system,” defense counsel Brenda Weksler shot back. "My objection is it's not a level playing field." Opening statements are expected to begin Tuesday Nov. 7. Note: This story has been updated with new information.